The new exhibition, CONTEMPLATING CHARACTER: Portrait Drawings & Oil Sketches from Jacques-Louis David to Lucian Freud, is now available for circulation to museums worldwide. The exhibition premiered at the Lowe Art Museum, Coral Gables, Florida in 2015, followed by exhibtion at the St. Petersburg Museum of Fine Arts, Florida, in February, 2016. The exhibition is available for scheduling beginning May, 2016 through 2020. The exhibition explores the evolution of portraiture from the end of the 18th century until the present. In contrast to portraiture as the tired flattery of the rich and powerful at the end of the eighteenth century, the invigorating new movements of Neoclassicism, Romanticism and Realism that took hold of art at the end of the eighteenth century and into the nineteenth century were the result of a desire for a sense of "unvarnished truth," and a more honest and gritty incisiveness of depiction emerged. By the twentieth century, the hallmark of the portrait was individuality; the sense of “personality” was primary, whether stylistically Post-Impressionist, Expressionist, Surrealist, or Realist. One of the primary drivers of this evolution was the invention of photography at the end of the 1830s; it freed creative artists from the necessity of providing mere likeness through their art, to the degree that Paul Delaroche said, “From today, painting is dead.” He was wrong, of course—the competition of photography simply freed artists from the chore of representation, allowing imagination to rule. It this evolution that CONTEMPLATING CHARACTER clearly demonstrates with stunning examples. 152 rare portrait drawings and oil sketches are featured, ranging from a late 18th century work by Jacques Louis David to four works by Lucian Freud, and including many remarkable works such as a French Revolution portrait of George Washington all of one half inch high; an unusual caricature of Charles Garnier (1825-1898,) the famed architect of the Paris Opera; an English portrait miniature circa 1810 depicting a single eye; a self-portrait reflected in a glass, part of a still life by Auguste-Hilaire Leveille; and a self-portrait by Louis-Joseph-Cesar Ducomet (French 1806-1856,) an artist born without arms! Additionally the collection shows remarkable strength in self-portraits, ireverently including such works as Alfred Hitchcock’s famous profile seen by millions at the introduction to the television series “Alfred Hitchcock Presents" (1955—1962,) and Aubrey Beardsley’s decadent India ink portrait of Oscar Wilde. [ 1 ] ARTIST SELF-PORTRAITS - (46): including Gustave Dore, Richard (“Mad”) Dadd, Adolf von Menzel, Roderic O'Conor, Antonio Mancini, Edouard Vuillard, Leon Spillaert , Frank Brangwyn, Dora Maar, David Levine, and Alfred Hitchcock. 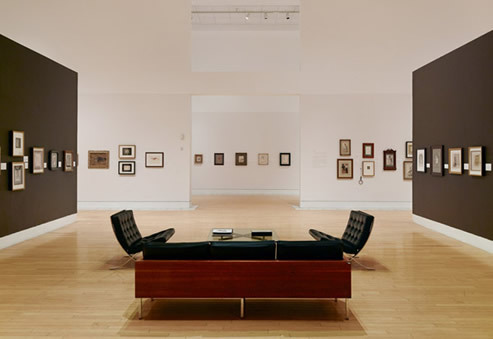 All of the works are drawn from the collection of esteemed curator, Robert Flynn Johnson, Curator Emeritus, Achenbach Foundation for Graphic Arts, Fine Arts Museums of San Francisco. A catalogue will be published for the exhibition featuring an essay by Robert F. Johnson. A gallery guide, label and text panel docs will be provided for printing. The exhibition is organized by Landau Traveling Exhibitions, Los Angeles, in association with Denenberg Fine Arts, West Hollywood. is a portrait of the artist, not the sitter. The challenge of any truly successful portrait is to capture the soul beneath the surface of an individual’s appearance. The works resulting from this collaboration between the individual who contemplates (the artist), and the subject who exhibits character (the sitter) are extremely varied. The resulting works display a wide variety of expression ranging from beauty and dignity to wit and satire, including profound sadness, and even the macabre. The exhibition attempts to broadly answer the question—what exactly constitutes a portrait? An expansionist sensibility has consistently informed my selections for this exhibition, including three portraits represented not by faces but by hands. Portraiture can be numbingly boring—best-forgotten renditions of bank presidents, college professors, and politicians; the endless limpid depictions of prior generations of relatives that no family member wants to inherit. However, portraits are also capable of being the most transformative, emotionally sublime, and deeply moving images in all art. Just consider our obsessive devotion to likenesses created by Leonardo, Rembrandt, Vermeer, Ingres, Degas, and Picasso. And apparently even the art market concurs with this assessment—eight of the ten most expensive works ever sold are some form of portraiture. As a collector of portraits since the early nineteen seventies, my focus has evolved over four decades. I have often said that as a collector, "the things I can afford I do not want, and the things I want I cannot afford." When my desire for ownership and my financial ability coincide—a work enters my collection. In the early days I asked a dealer why a strikingly beautiful portrait drawing I had just purchased was so reasonably priced. Sighing, he told me, "in general collectors avoid portraiture unless the sitter is an exalted personage." He continued, "It is a very undervalued area of collecting." The fact that there are no portraits in the exhibition by artists such as Ingres, Delacroix, Van Gogh, Gauguin, Picasso, Matisse, or Giacometti is not out of any lack of respect for those artists. On the contrary, acquisition of major works by such artists as these was my mission for the museums in which I worked for forty years. This exhibition is drawn from the collection of a scholar, acquired on a scholar's salary, whose focus was limited because of his professional responsibilities. Nevertheless, I relished the hunt for examples of portraiture displaying skill and imagination without concern for name recognition or price, which drives so much of the art market today. In my understanding and taste I am eclectic, and honestly enjoy and respect narrative and religious art, landscape, still life, and abstraction. In the end, however, I am fervently drawn to the vast variety of depictions of human beings in all their grandeur, helplessness, pride, and vulnerability. Every drawing in this exhibition has moved me deeply in some human way.